Red Room Study (01), 2015, 1:34 loop, silent. The videos in Rachel Rampleman’s Lynchian series Red Room Studies pay homage to New York City’s exciting and thriving neo-burlesque scene. 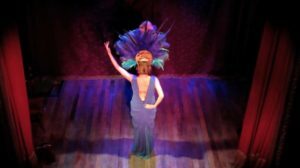 Shot exclusively at Manhattan’s Slipper Room between 2013 – 2017, each Study is a discrete snippet extracted from the various performers routines, and infinitely looped. Water/Light Study, 2015, 11:38 loop, sound. The imagery in Water / Light Study was captured by the artist by aiming her camera at a pond as the wind and sun played with and on the surface of the water. 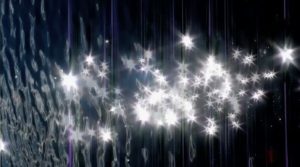 The ensuing ripples and reflections become a dazzling and mesmerizing abstraction as recorded by the camera’s sensor. 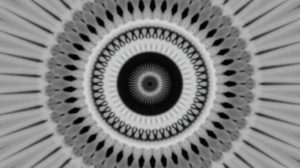 Busby Berkeley 2.0.3 , 2016, 1:59 loop, sound. 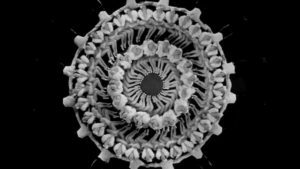 In Rachel Rampleman’s Busby Berkeley 2.0 series, nostalgic 1930s routines choreographed by Berkeley and performed by Hollywood showgirls are transformed into something more hypnotic, industrial and menacing. Exploring ideas posited in Siegfried Kracauers’ essay on the mass ornament and utilizing the latest video editing technology, the showgirls’ forms are further abstracted to the point of no longer being recognizably human. Rachel Rampleman was born in Cincinnati, Ohio and currently lives and works in Brooklyn and Esopus, NY. She received her MFA in Studio Art from NYU’s Steinhardt School of Art & Art Professions . Best known for her witty and acerbic video work challenging gender stereotypes and constructions of “feminine” identity, her work has been shown in New York at VOLTA NY, Petzel Gallery, Socrates Sculpture Park, SPRING/BREAK Art Show, Flux Factory, the Brooklyn Academy of Music and nationally at The Warhol Museum, the Miller Gallery at Carnegie Mellon University,and PULSE in Miami, FL, among other venues. Internationally, her work has been exhibited at the Shanghai Biennale (Brooklyn Pavilion, 2012-13) in China, the Chennai Photo Biennale (India), JAM in Bangkok, Thailand, and throughout Europe. Rachel recently had solo exhibitions at These Things Take Time in Ghent, Belgium, Carl Solway Gallery and the Mini Microcinema in Cincinnati, as well as an early career retrospective at The Center for Exploratory and Perceptual Art (CEPA Gallery) in Buffalo, New York.